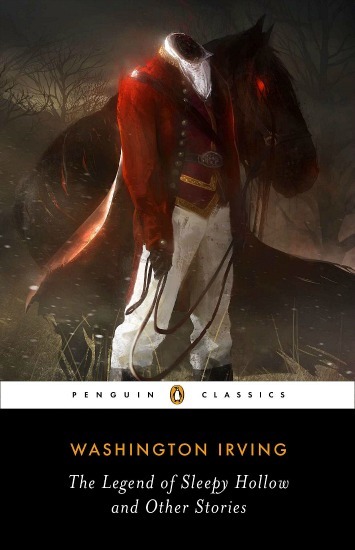 The Legend of Sleepy Hollow is an iconic American short story written by Washington Irving and published in 1820. The story is set in a Dutch settlement in 1790 New York, in the secluded village of Sleepy Hollow, where schoolmaster Ichabod Crane pines after the lovely Katrina von Tassel. After a harvest celebration, where scary stories were told, his competition for fair Katrina’s heart, Brom Bones, along with other members of the town, preface the superstitious suitor’s encounter with the local spirit, The Headless Horseman, while riding home. The ghost of a Hessian soldier separated from his head, The Horseman chases Ichabod through the woods, racing for safe passage over the bridge the legendary phantom is unable to cross. However, the story ends with the townspeople baffled by Ichabod’s unheralded disappearance, with only a smashed pumpkin lying on the road next to his deserted hat, left behind from his flight through the forest. The story is widely considered as one of the most enduringly popular American short stories ever written. Hundreds of adaptations and allusions made to the classic tale permeate popular culture, as well as the general cultural practice of Halloween itself. The real-life town of Sleepy Hollow, New York celebrates the legacy of the “Legend” with a yearly historic celebration… and its local high school football team name? The Horsemen! With a legacy spanning across multiple forms of media, “The Legend of Sleepy Hollow” might be most recognized via such adaptations as Tim Burton’s 1997 take on the tale, Sleepy Hollow, which starred Johnny Depp and Christina Ricci, or even Disney’s 1949 musical short, The Legend of Sleepy Hollow (which brought about the Bing Crosby hit, “The Headless Horseman”!). 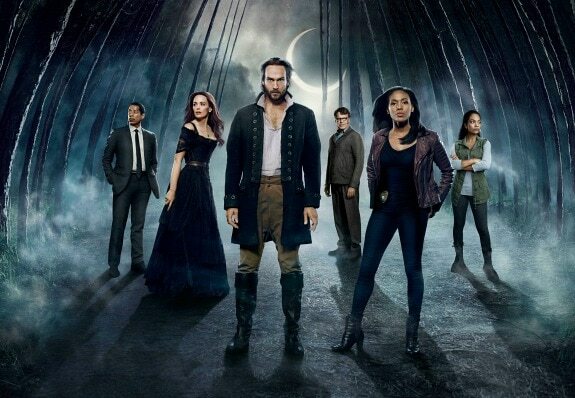 The most recently popularized adaptation of the short story is Fox’s Sleepy Hollow television series, which premiered in 2013. Subverting the traditional ghost story through the lens of the Biblical Four Horsemen of the Apocalypse – with the Headless Horseman also serving as the Horseman of Death, and Ichabod Crane as one of the two Witnesses sent to destroy him – Sleepy Hollow was renewed for its second season after only three episodes had aired. Starring Tom Mison as Ichabod, and Nicole Beharie as his co-Witness and partner in defending the town, Police Lieutenant Abigail Mills, the series remains generally well-received by critics and viewers alike. By integrating key elements from the short story into your own wardrobe, you, too, can have a look just as fit for the fall weather as this Halloween-y hit. Just make for the bridge, with all your might! Product Information: Scarf – Amazon, Earrings – Nordstrom, Sweater – Modcloth, Jacket – American Eagle, Nail Polish – Butter London, Boots – Aeropostale, Skirt – H&M, Socks – Charlotte Russe. The classic tale is just one of many fall favorites that crop up this time every year. From pumpkin patches and apple orchards to hay rides or just watching the leaves crunching underneath your feet on campus, college women everywhere love to celebrate the season. The people of Sleepy Hollow celebrated their own harvest festival in the short story, so why shouldn’t you go out and have some fall fun yourself? Channel the seasonal vibe of the short story into your own look by crafting the perfect fall outfit from some unabashed seasonal favorites. Tall brown boots, thick thigh-high socks, a denim jacket, and a cozy infinity scarf are standards for any college-aged woman around this time of year, but a graphic animal sweater, plaid wrap skirt, vintage-looking jewelry, and multichrome nail polish are updated versions of old standbys. Product Information: Necklace – ASOS, Dress – Modcloth,Headband – ASOS, Jacket – NastyGal, Bracelets – Charlotte Russe, Boots – 6PM, Tights – Modcloth. One of many reasons for the enduring legacy of “The Legend of Sleepy Hollow,” is its status as an early demonstration of the Romanticism movement in US Literature. Alongside works like Nathaniel Hawthorne’s The Scarlet Letter, or the poetry of Emily Dickinson, Romanticism was a rally against the growing Rationalization movements of the time, and celebrated elements of literature – emotional thought, the beauty and impact of nature, and the presence of supernatural forces – as well as boasted the Gothic literary movement as under its umbrella. Channel the Romanticism movement by bringing those same elements of the literature style into your outfit with elements like intricate lacework, flowy fabrics, and bright ornamentation. Chiffon is a flowy, beautiful fabric, but is a little hard to wear by itself in the fall, so layer up this moody wine-colored shift with black lace tights and a black lace open jacket. Nature comes into play with a gold leaf necklace and headband, while the outfit gets a little more grounded with tall booties and set of mixed media bangles. Product Information: Lipgloss – Stila, Sweatshirt – J. Crew Factory, Coat – Forever 21, Jeans – Delia’s, Boots – Overstock, Bracelet – Bloomingdale’s, Shirt – Target. This article would be entirely remiss if I neglected to focus on the true star of this short story, and one of the most iconic villains in American literature: the Headless Horseman! This dark rider has had many incarnations through the ages – even beyond Sleepy Hollow! – and has been found in traditional tales since around the Middle Ages. Cropping up in various facets of European folklore, like the Irish “dullahan” and even tales from the Brothers Grimm, the fearsome figure of a horseman who rode carrying his own head has made its rounds. Channel the Headless Horseman into your own easily-wearable look with all-black basics and fashionable takes on riding gear. Tall black riding boots, skinny dark-rinse jeans, and a long black coat, are all fall basics in the Horseman’s signature hue, while a plaid shirt layered under a graphic horse sweatshirt brings a bit of the legend to the real world. A gold saddle bracelet cements that status and a glaring gash of red, in the form of a long-staying lip gloss, brings a highlight to your face… even though the Horseman wouldn’t have had one! Have you ever read “The Legend of Sleepy Hollow?” What’s your favorite ghost story? Are you excited for Halloween? What do you think of the outfits and styling tips? Let me know in the comments below!